We are very proud to have recently successfully completed several large contracts on the £450m Bay Campus, for Swansea University and its development partner St. Modwen. In 2014, Lock-Tech were selected by another local firm, RDM Ltd, to design, supply, install and commission the swipe card access control system on the student accommodation and support offices. Shortly after this, Lock-Tech was again chosen to supply and deliver the ironmongery package for the same doors, working directly with main contractor VINCI Construction UK Ltd. Appointing Lock-Tech not only meant that one of UK’s leading SALTO access control companies would deliver the desired access control solution, but it also ensured a local company benefitted directly from Swansea’s Bay Campus project. The award of these contracts presented a significant opportunity for employment and training for local people. The original design work on the contract started in 2013, with the main campus works completed in September 2015, and the latest phase of accommodation only recently completed in January 2016. Delivering this contract was a huge achievement for Lock-Tech. This project, along with several other large projects we’ve won this last year, has contributed to the company achieving our best ever turnover. As a company which has been in operation since 1933 and employs all staff directly, we will continue to support local employment and training both now and into the future. Hopefully we’ll see more large projects like the Bay Campus coming to the Swansea area. Winning the contract was one thing, but delivering this project was another. I’m pleased to be able to say that we have now achieved delivery of this project and this is down to the hard work our team has put in over the last 2-3 years. Delivering on projects of this scale actively demonstrates our ability to deliver a quality service on time and to budget. The scale of the project that Lock-Tech Systems completed involved over 2000 SALTO RFID locks, throughout all of the residential buildings. Lock-Tech Systems’ thorough expertise in supplying, installing, configuring and supporting the SALTO RFID Mifare lock technology made them the obvious choice. Student accommodation lends itself in particular to Lock-Tech System’s access control solution. Campus staff often have to manage access and security to a large number of doors for an ever larger number of users. Tasks can include assigning rooms, distributing keys, retrieving old keys and issuing new ones, and this can be a very time consuming task that involves large numbers of staff and lengthy waits for students. Then, there is the matter of lost keys and their associated costs which only adds to the workload. Lock-Tech Systems provide a modern technical solution to the above that can combine a student ID card with a door key. Furthermore the same card can even be used for managing in-room energy usage, as well as for cashless payments for vending machines, printers and photocopiers. Student halls of residence are busy places with high traffic areas, so any locking system has to be robust. Encrypted RFID technology is also an important requirement, but it needs to be reliable and easy to install. Also, the system needs to be capable of integration with the campus IT network and be simple to administer from the support staff’s PC’s. In addition, a variety of locking hardware options needs to be provided for access control on different types of doors. 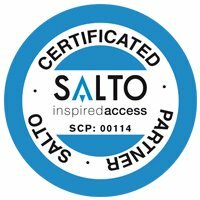 As Lock-Tech have been heavily involved with SALTO since 2001 when SALTO first launched in the UK, specifying SALTO’s XS4 solution as the locking system was the easy part. The most challenging part was co-ordinating the supply, installation and setup of such a large number of doors in a busy and relatively short construction schedule. ‘Ensuring the safety and security of occupants in student accommodation is always a high priority’ confirms Anthony Harvey, Head of Lock-Tech Systems. ‘Looking at the layout of the campus and the position of the various buildings, we assessed usage and the level of security required and then worked with RDM Ltd and VINCI to design and subsequently install a highly secure and flexible networked access control system to meet all the needs of the university. Learn more about the new £450m Bay Campus.